Scarce first edition of the official map of Captain Cooks seminal discoveries in Alaska. Chart of the N.W. Coast of America and N.E. Coast of Asia explored in the Years 1778 & 1779. The north-west coast of North America was sighted on 7 March and for the next six and a half months Cook carried out a running survey of some 4000 miles of its coast from Cape Blanco on the coast of Oregon to Icy Cape on the north coast of Alaska, where he was forced to turn back by an impenetrable wall of ice. A search for a route back to Europe north of Siberia also proved fruitless. During this cruise Cook became the first European to enter Nootka Sound on the north-west coast of Vancouver Island, where he remained for a month taking astronomical observations and cutting spars for use as spare masts and yardarms. Trade was carried out with the native Mowachaht for furs, mostly of the sea otter, which when sold later in China drew attention to the commercial potential of this trade. 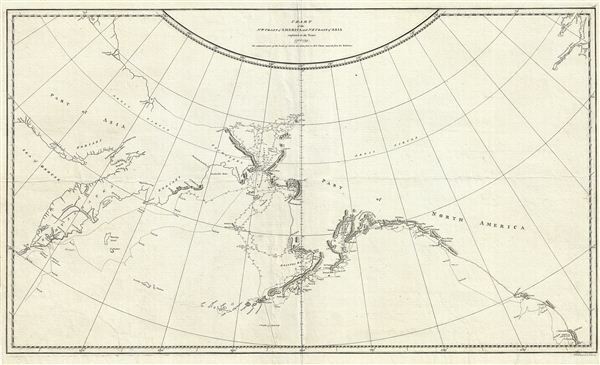 Cook's discoveries on this, his third voyage to the Pacific, finally put to rest confused notations of a Sea of the West as well as hopes for the discovery of a Arctic northwest passage. This map was engraved by T. Harmer for the official account of Captain Cook's voyages, published in 1784. Cook, J., and King, J., Voyage to the Pacific Ocean, undertaken by the Command of His Majesty, for making discoveries in the Northern Hemisphere. Performed under the direction of Captains Cook, Clerke and Gore, in His Majesty's ships the Resolution and Discovery , in the years 1776, 1777, 1778, 1779 and 1780, (London) 1784. Very good. Original centerfold exhibits slight wear. Platemark visible. Kershaw, K. A., Early Printed Maps of Canada, #1140. Rumsey 3405.026. David, A., The Charts and Coastal Views of Captain Cook's Voyages, 3.95A. Hayes, D., Historical Atlas of th North Pacific Ocean, map 137. Wagner, H. R., The Cartography of the Northwest Coast of America To the Year 1800, 696.